International Development Week has long been a Canadian tradition. It marks a time for Canadians to commit to becoming partners in a building a better, more equitable world. That is why on this year’s International Development Week, we’re excited to announce the next team of Canadian healthcare providers, experts and advocates from all across the country that will participate in Horizons’ second, ten-day knowledge exchange to Totonicapán, Guatemala. Twelve Canadians representing diverse professions and backgrounds will learn first-hand of the challenging maternal, newborn and child health (MNCH) realities Indigenous Maya K’iche’ peoples in Totonicapán face, a predominantly Indigenous province with one of the highest maternal mortality rates in Central America. They will directly meet and exchange knowledge with traditional Indigenous Maya K’iche’ midwives, community health educators and medical staff at health posts, centres and the Totonicapán provincial hospital – all vital actors in strengthening MNCH through Horizons’ four-year, $13.2 million ‘MNCH: Transforming Indigenous Lives’ project co-funded with the Government of Canada. The Canadian team consists of family doctors, nurses, community health promoters and organizers, an obstetrician, a dietitian and midwives – including one of the first Inuit Registered Midwives in Canada to be licensed. Members hail from towns and cities throughout Ontario (Cobourg, Peterborough, Kingston, the Greater Toronto Area), Alberta (Calgary) and as far as Nunavut (Rankin Inlet) and the Northwest Territories (Fort Smith). Masters-trained dietitian based out of Kingston, with 30 years experience leading initiatives to address food insecurity as well as maternal and child nutrition. Family doctor providing obstetrical care and Chief of the Maternal Child Program in the Northumberland Hills Hospital, Cobourg. Registered Midwife in Fort Smith with experience providing midwifery services in underserved areas of the Far North to primarily Inuit and Indigenous populations. Registered Midwife and Acting Manager of Maternal Newborn Health Services at the Rankin Inlet Birthing Center. One of the first two Inuit Registered Midwives in Canada to be licensed. Community Health Nurse with the Kingston Community Health Centres, providing prenatal and breastfeeding education as well as counseling on infant and child health. Rural family doctor based in Cobourg for the past 25 years, with extensive hospital work, obstetrics and administrative medicine experience that includes prior work with the Kahnawake First Nation south of Montreal, Quebec. Community outreach expert in Cobourg with experience organizing public education and support of international projects with a focus on the empowerment of women. Registered Nurse in Kingston with more than 30 years experience nursing in Canada, Ireland, the US and the UK, providing prenatal, post-natal, newborn and early childhood-to-adolescent care. Consultant obstetrician and gynecologist working alongside family doctors and midwives in the Greater Toronto Area for over 30 years, with experience working in communities with minimal medical care in Jamaica. Licensed practical nurse and Masters in Public Health candidate, with experience in acute care units and current Clinical Placement Officer at Bow Valley College in Calgary. Women’s health promoter in Peterborough working to reduce systemic barriers (focusing on violence, stigma and criminalization) women at increased risk of HIV acquisition face. Labor and delivery nurse for over 20 years, working in Cobourg’s Northumberland Hills Hospital Birthing Suites and current clinical instructor with Trent University in Peterborough. Mutual respect and understanding is at the center of partnerships for a better world. 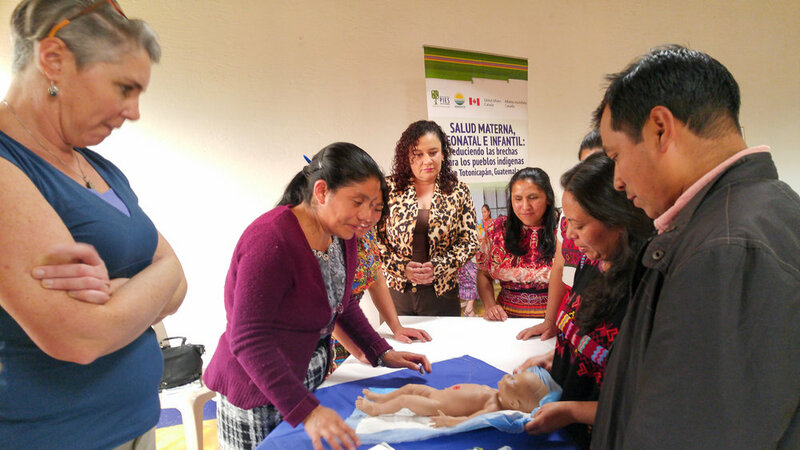 We are proud to facilitate respectful, two way-learning with our local partner PIES de Occidente and the Totonicapán Health Directorate through exchanges such as these, nurturing cooperation between Canada and Guatemala while bringing development and social justice issues to the forefront. Check out our blog, Instagram, and Facebook page over the next weeks to follow the story of how the North and South are coming together to help bring about a transformation for one of the region’s most affected, but resilient communities: Indigenous Maya women, children and families in Totonicapán, Guatemala. For more information or to get involved, please contact Raúl Scorza at rscorza@horizons.ca.